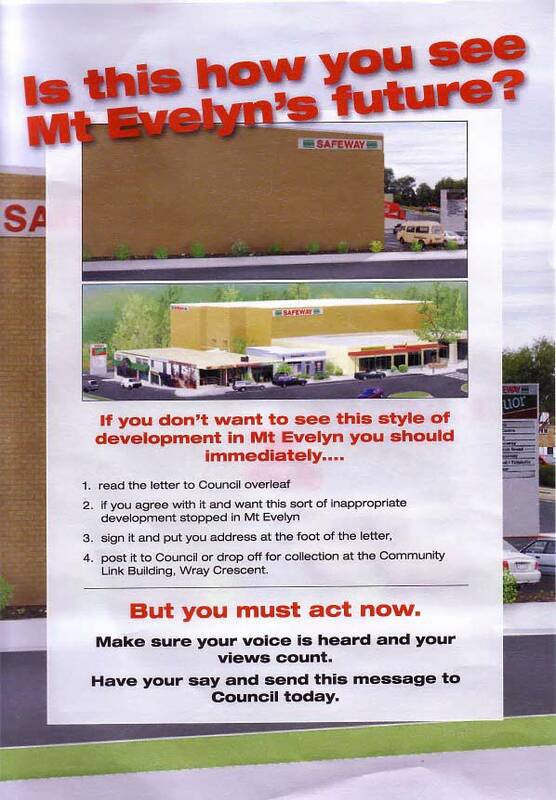 Residents and traders of Mt Evelyn were recently sent a call to action leaflet about the Design and Development Overlay (DDO) and an update on the fight to keep Safeway at bay. Many people were surprised to hear that the Safeway issue wasn't dead and buried. The general feeling was that the overwhelming support shown at the public meeting to keep Safeway out had laid the issue to rest. However, the DDO for Mt Evelyn still hasn't been ratified. In fact, it has been referred to the Ministry of Planning (Rob Hulls, State Govt), and it will be decided in the final instance by the State, rather than local Government after all submissions have been considered. The DDO is now back with the council after being on display during September. Some residents and traders are worried that it may be watered down and effectively weakened.